The classical city took its name from the long-snouted Oxyrhynchus fish (the name means sharp-nosed), of which there was a local cult in the Egyptian manner. 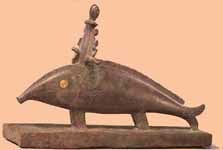 A figurine shows the fish faced by a worshipper. Since the start of the Islamic period, the town has been known as el-Bahnasa or Behnesa.